So if this is anywhere near right carbon should be accumulating in the atmosphere at about 4Gt/yr these days, less in the past, and likely more in the future. While we sweat out the details of which sinks are pressure, temperature, pH, or chemically limited, it is worth bearing in mind the magnitude of the sinks. Temperature and partial pressure apply everywhere (albeit differently). Chemical and pH limitations apply mostly to the ocean which constitutes less than half of the total cycle. Chemical and pH constraints are predominantly inorganic. 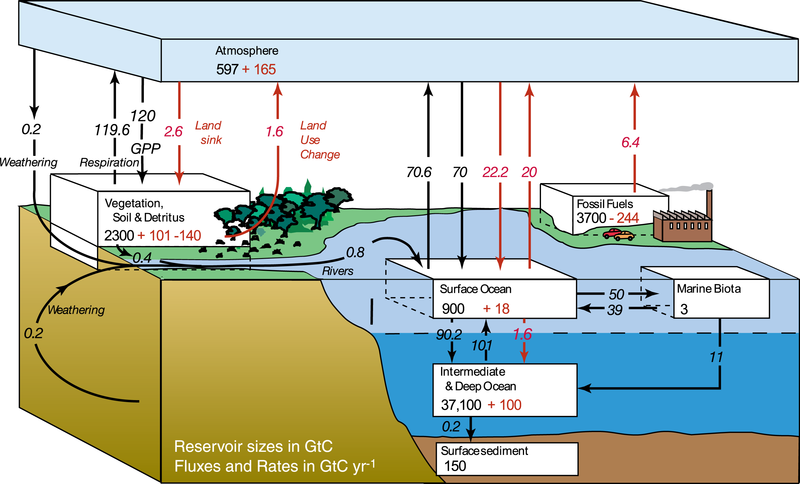 Please notice that while lip service is given to photosynthesis and respiration in the photic zone of the ocean, no attempt is made to ascribe C flux values for these except the 2 Gt budgeted for carbonate rain. It is worth noting that carbonate precipitation actually increases pCO2 in the water as a result of the pH change. There is another graphic from NASA that could be written off for its preposterous attribution of human influence, but nevertheless gets the overall numbers right and contains some more detailed information. The ocean is the repository for biologically rejected isotopes. They travel by the rivers and the winds from land and also accumulate from biological rejection by plankton. Ocean sinks and sources are nearly half non biological (inorganic) and blind to isotopes. Ferdinand Engelbeen says that 40Gt goes into (and presumably comes out of) the deep ocean so that leaves 50Gt of ocean flux that is probably biological. This agrees with the graphic above. 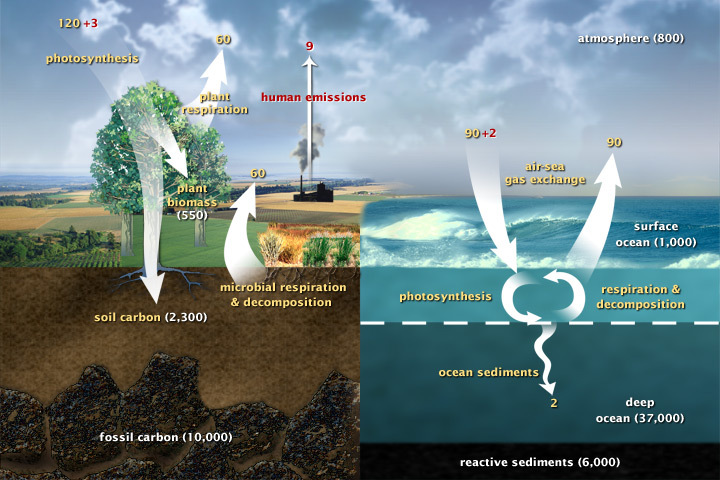 If this is right, 80% of the carbon cycle shares an isotopic signature similar to human production. This may mean that it will be very hard to ever know if the 9 human Gt out of the172 Gt total biological cycle are the very same ones causing the 4Gt current annual increase. This entry was posted in Carbon Cycle, Carbon Dioxide Loves to Swim, Climate Change, Geography, Oceanography and tagged Atmosphere, Carbon cycle, Carbon dioxide, NASA, PH, Weathering. Bookmark the permalink.